Dahi badey is a delicious and popular snack and street food made with gram flour (besan) and curd. It is made differently in various states across India. Dahi badey is a popular snack at my home and I am sharing the recipe of Dahi badey the way we make at home. It is quick, easy and delicious and a great snack you can turn to on those rainy or winter evenings. First take a pan, add oil as required for frying and heat it. While the oil is getting heated, take a bowl, add gram flour, red chilli powder, cumin powder, salt, onions and coriander leaves and mix well. Add just a few tsps of water and mix to form a thick batter. You must be able to make round fritters out of it. Now take small balls and gently add them to the hot oil. Fry in medium flame till golden brown in colour. For the curd dressing, take curd in a bowl, add salt and green chillies and mix well. 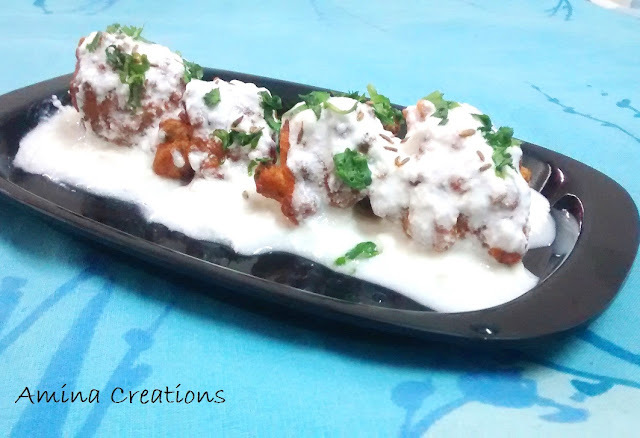 Arrange the badey (fritters) on a plate and pour the curd dressing on top. Garnish with coriander leaves and cumin seeds. You can also garnish with fine sev and garam masala powder on top for more look, colour and taste. I love this and have been wanting to make it since long... looks so tempting!